Before TV and the Web, LIFE Magazine was the biggest thing in mass media. The large format pictorial news weekly was the best selling magazine in the US with a weekly circulation of over 13.5 million in the 1940’s. 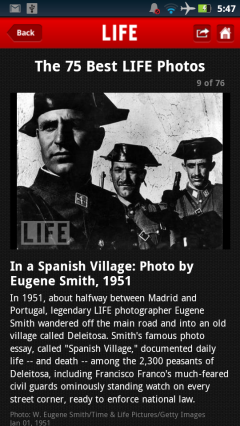 LIFE played a major role in the development of the craft of photojournalism. It published many of the best photographers of the 20th Ccentury including Alfred Eisenstaed, Robert Capa, Margaret Bourke-White, Andreas Feininger, Dorothea Lange, Gordon Parks, W. Eugene Smith and Edward Steichen. Unable to compete with television, LIFE ceased publication as a weekly in 1972. It resumed several years later as a monthly and published its last issue in 2000. In 2009, LIFE’s parent, Time, Inc., launched LIFE.com as a joint venture with Getty Images. The site draws from the combined LIFE and Getty photo archives of over 10 million images to create a revolving gallery of some of the best current and historic news photos on the Web. The image archive is also searchable. LIFE’s mobile site is more of the same in a smaller scale. It includes image search and a rotating gallery arranged by topic. Formatted for a minimum screen width of 320 px and with page sizes of up to a megabyte, LIFE Mobile works best with smartphone browsers or Opera Mini on large screened feature phones. This entry was posted in Images and tagged LIFE Magazine, photography by Dennis Bournique. Bookmark the permalink.